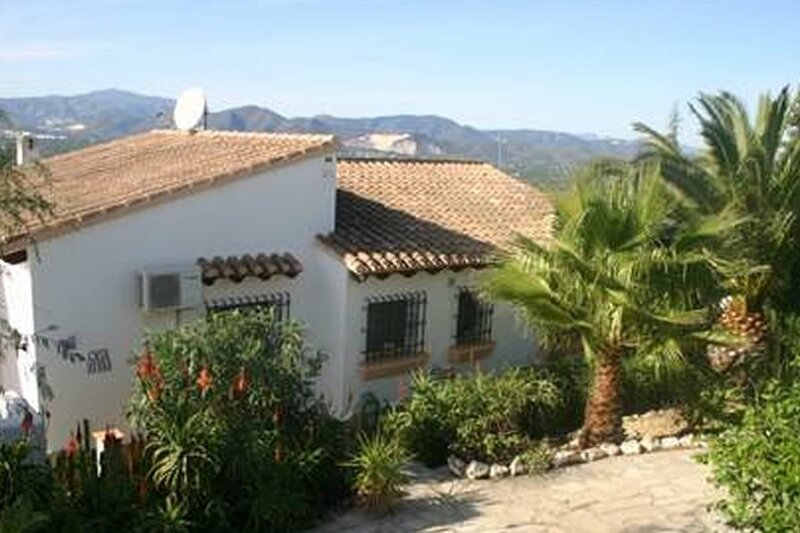 Monte Pego: Family friendly Villa with Napa, Pool, AirCon, Barbecue Stunning Mediterranean views. Stylish, Prestigious development. Available throughout the year. Villa Casa Bella Monte Pego (Formerly Casa Diana) has a glorious panoramic view to the Mediterranean coast and mountains; set in over 1000 m² of established garden provides privacy. Forget and beat the credit crunch. We have returned to Click Stay as they offer transparent charges to our guests. Our reviews on the Web bare testament to our values and desire to ensure a vacation to remember. Join our numerous returning 'guests' 'friends' that return year after year. A beautiful pool provides the heart of the holiday. At night sit in the Napa by the pool, become absorbed by the clear night sky, shooting stars and all. Help yourself to the lemons and olives that grow in the garden BBQ and summer kitchen provide that Al Fresco ideal. Feel safe in the knowledge that the children are within view and easy reach. We chose Casa Bella because we had young children. Casa Bella's lounge area has views to the sea and mountains, we are members of the Villa Rental Association (VRA) which has the aim us to provide re assurance. Casa Bella is managed by us and as such you know that the personal touches and assurances will make your holiday what it should be, spot on! Easy access to mile after mile of blue flag beaches, 3 World Standard Golf Courses and plenty of family activities. Pop into classical but modern towns of Javea or Denia for retail therapy or excellent cafe culture. The pool terrace allows you to sit by the pool take in the same glorious views that the bedroom terraces do. You will see all of our reviews reflect the value we place in making your holiday a relaxing experience. We are flexible on most things so do not be afraid to ask of us any question. Monte Pego: Monte Pego is a community of modern villas and apartments, on site security provides re assurance to all residents. The site has on the opposite side to Casa Bella, has a wonderful cafe/bar (Bella Vista) where for a small charge you can access the Gym facilities. Winter Lets: Love to have the villa occupied so if you want a long winter let at a very reasonable price then just contact me for details. Contact me to arrange a bespoke package and price. Book direct and avoid credit card charges, and fees. Simply inquire and get a straight and simple breakdown of your holiday cost. If booking through this site by credit card, any charges made to me will unfortunately be added to your holiday cost - I am happy to take credit card and or PayPal. Direct, I am also more than happy to satisfy you of my bona fidie. 'Villa Casa Bella Monte Pego' simply create a holiday that you will treasure. Use the cool-boxes provided & take a picnic to the beach. Visit Aqualandia water theme park in Benidorm after 3 pm for a reduced price & cooler experience. Finally just relax and enjoy, comprehensive information is provided but any questions simply ask.